It’s Friday night, and here at The No Seatbelt Blog, I celebrate it by writing about toys. Because that’s what nerds do. Every week, I showcase another piece of my collection of Funko’s Pop! vinyl figures, offering some background on the featured character, its origin, and significance to me. Funko has won a piece of my nerdy heart with this line of compact, inexpensive, big-headed collectibles, and my collection of them has grown exponentially over the last few years. Ever since I was a wee lad, Batman has been a hero to me, one that I wished, and still wish was real. No matter how corrupt the government and police forces become, vigilantism has always gotten a bad rap. However, when an eccentric billionaire decides to dress up in a bat costume and take out the trash that the authority figures refuse to put or keep behind bars, you have to let it slide. Batman, for the better part of my three decades on this earth, has permeated much of my field of vision – I’ve watched and loved the movies and the cartoons, I’ve collected (and recollected) the toys, and I’ve even dressed up as him for Halloween. Those who know me have heard ad nauseum about how my dream car would be The Batmobile (the one from the 1989 film). Figures from the universe of Batman are one of my primary targets in my continuing collection spree, and I may never be able to stop. I have acquired all five of Funko’s Pop! 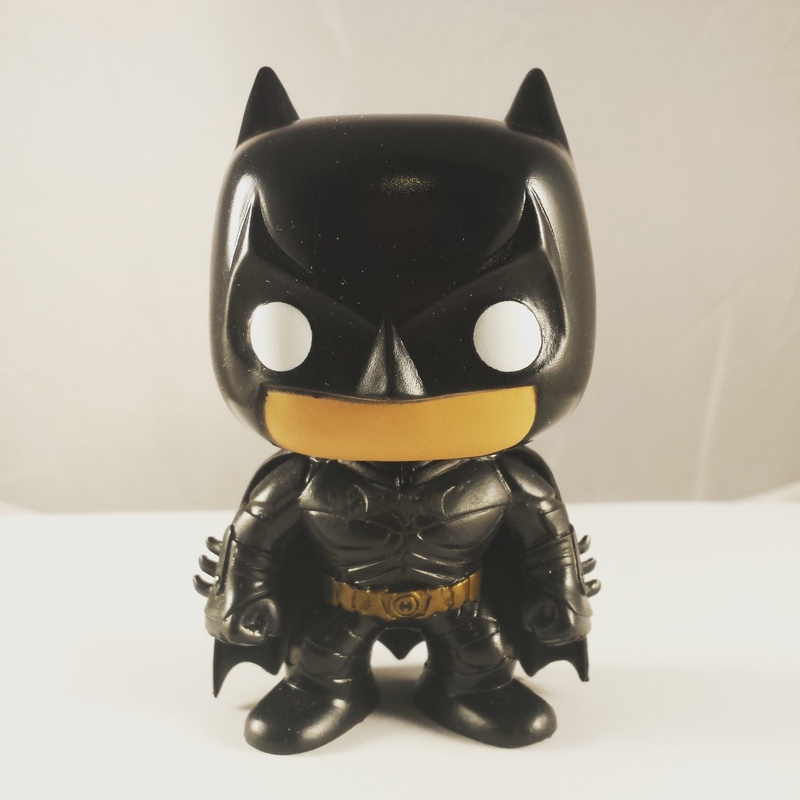 dolls that the company released for Christopher Nolan’s brilliant Dark Knight series, and have featured Bane and the Joker on previous editions of Funko Friday here at The No Seatbelt Blog. The Batman figure is depicted as he appeared in that monumental trilogy, complete with his famous cowl, high-tech armored suit, cape, and utility belt, with the Batman symbol emblazoned on his chest. Despite what Jim Gordon might say, this is the figure you deserve, and it also happens to be the one you need right now. Do you collect Funko’s Pop! dolls, or any other toys? Show me pictures of your collection! I love talking to other collectors and admiring their prized pieces! Funko Friday will continue here every week, and I have started another toy series called The Toy Chest! The first installment of that new series featured my cherished John McClane action figure from Die Hard, courtesy of NECA and Reel Toys! Check it out!